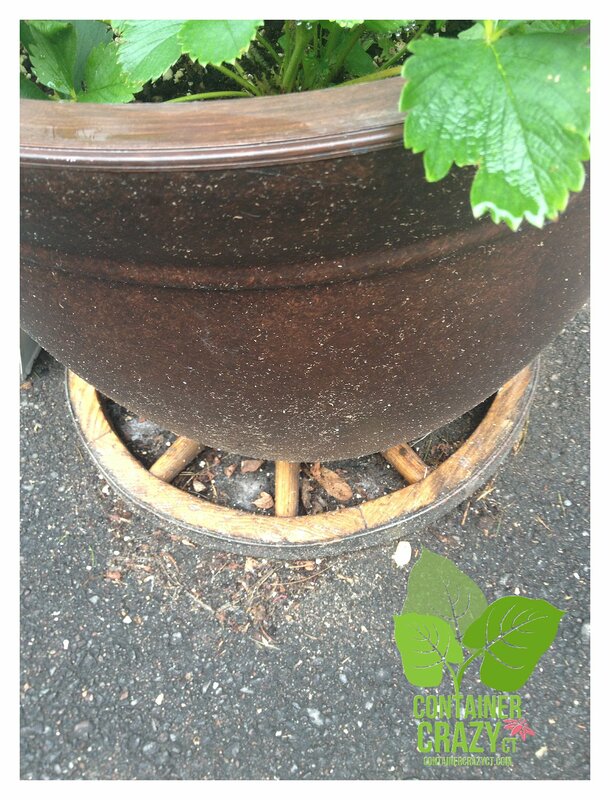 We are experiencing wet, damp, humid, and even cool air conditions right now in Broad Brook, Connecticut due to the current weather pattern – and your plants are getting a good soaking, which can be very helpful for plants in the ground, but when it comes to plants in container gardens and patio pots, overly wet soils and wet surfaces around plants can lead to problems such as fungi, diseases, and the unsightly yellowing or rotting of leaves. Hopefully, if you used good porous soil in your pots, and provided plenty of drain holes at the bottom of your pots, the soil is draining freely and your plants are holding up well. 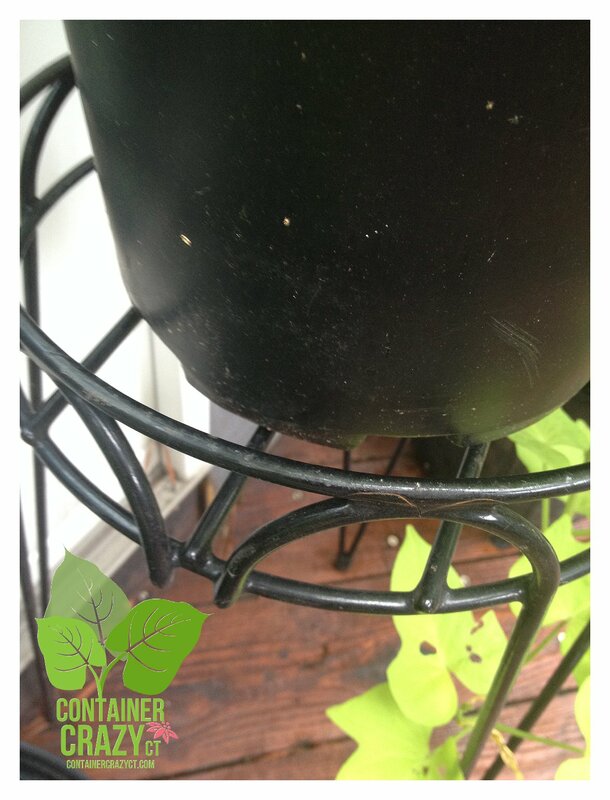 But sometimes, pots sitting on a flat surface may be sitting in collected water at the base of the pot during constant rainy weather, which is keeping things wet in or around your patio pots and plants. 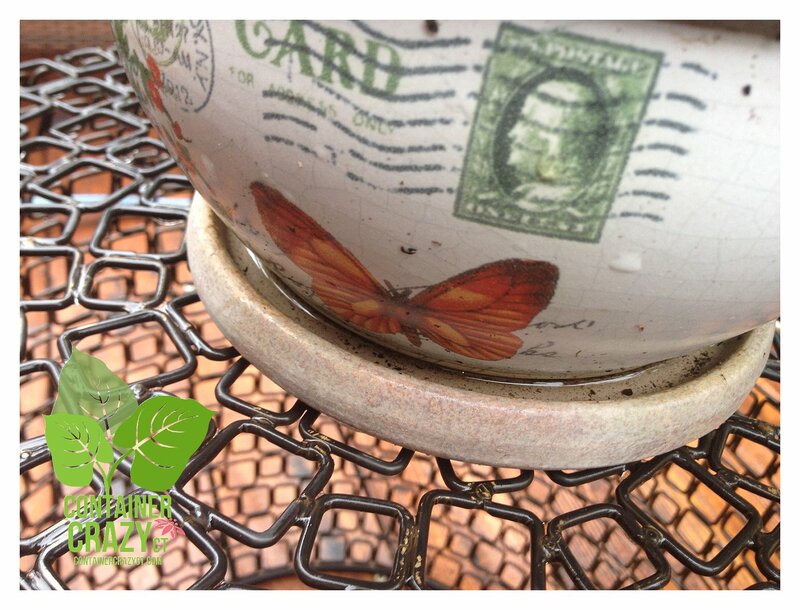 To avoid an overly wet situation, which may lead to plant problems, one easy thing you can do is elevate your patio pots a bit to provide a gap between the base of the pot and the surface it is sitting upon. And the gap you provide by placing something under the pot doesn’t have to be super thick or wide, all you need is a few inches or less. As you can see, the gap is slight here but it allows air under the glazed pot and prevents the wood base used as a plant stand to not stay wet all the time. Maybe you have a trivet in your kitchen? So long as it has spaces or gaps to provide places for the air to move, this will help the situation from staying really wet. It will help the wooden plant stand from rotting as well. Maybe you have a couple side tables on your deck? 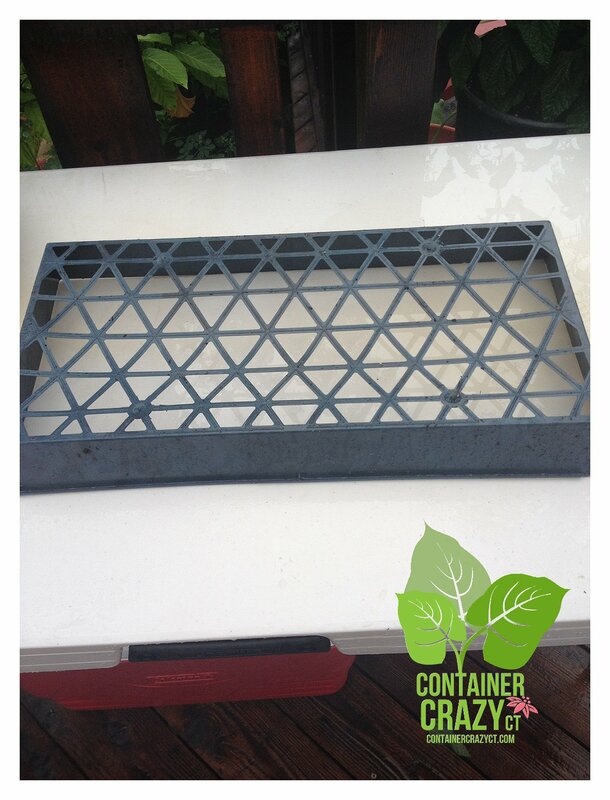 If they have a grate-like or open pattern, such as this one, it is a perfect way to elevate a pot to allow circulation under the pot, and to also showcase your container garden at a higher level. This pot has a watermelon plant in it so the elevation helps the vines to trail down nicely as spillers in the container garden. 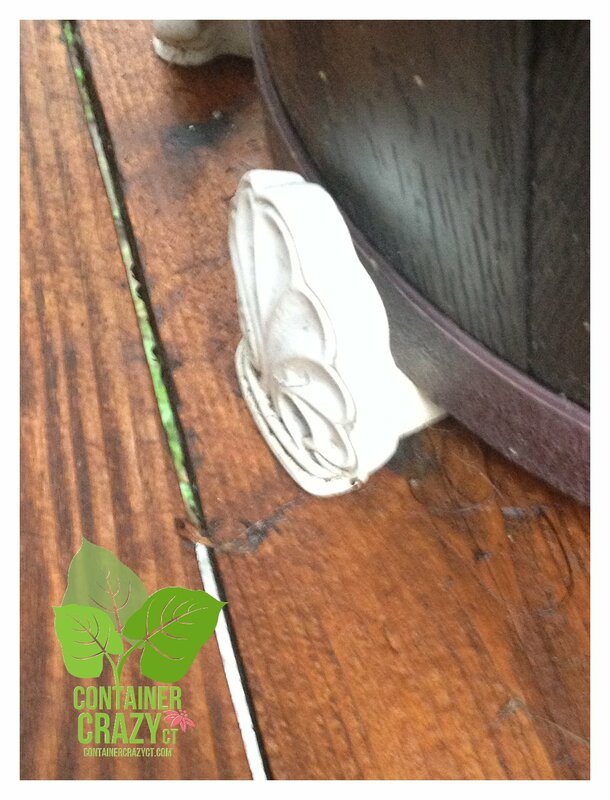 Many stores offer little pot feet, which I like – they are handy and easy to store. And if they have some cute pattern or decoration on them, it can look nice. Place each one on the floor and then place pot on top – adjust as needed to balance the pot. 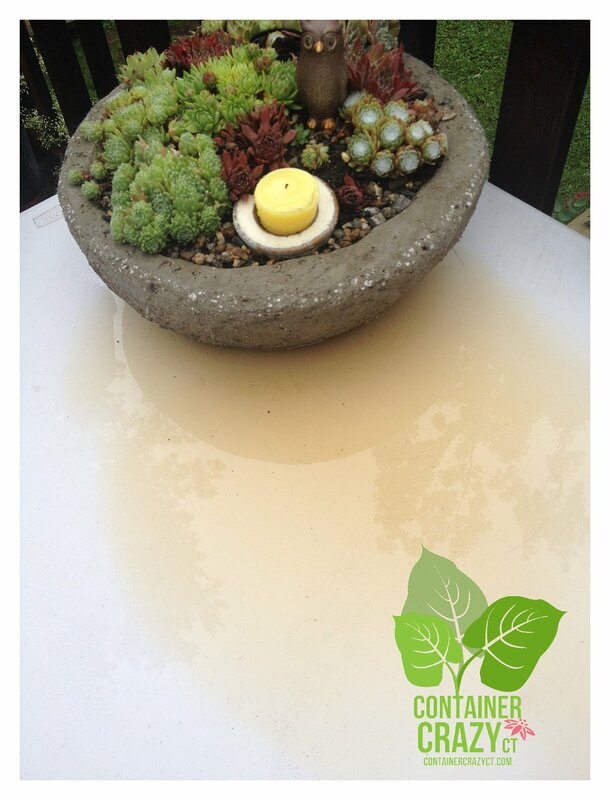 A simple and easy elevation allows the water to drain when watering on non-rainy days, instead of that water sticking around under the pot, causing the floor to stay damp. 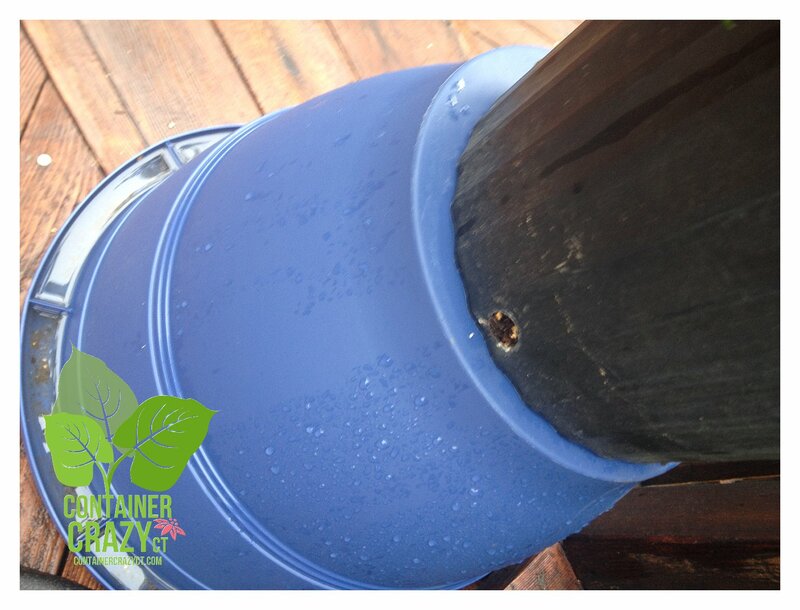 This will help your wooden deck or patio surface to not get water rings too. This Hypertufa planter is sitting on a glass surface. The pot is porous, sure enough, but the glass below this square planter forms a seal of sorts and the water stays collected under the Hypertufa planter. 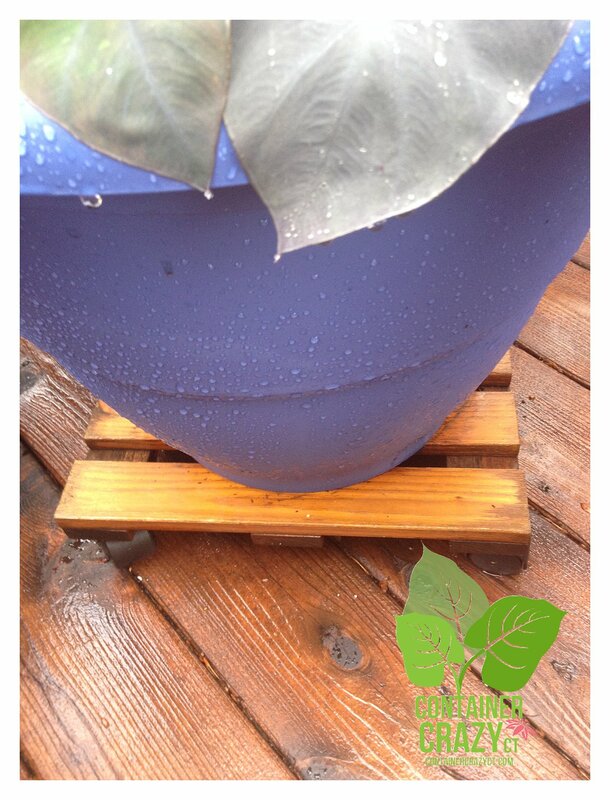 In wet conditions like we are having this week from the weather, I definitely prefer to have that little elevation below this planter – and coasters are perfect for this one. 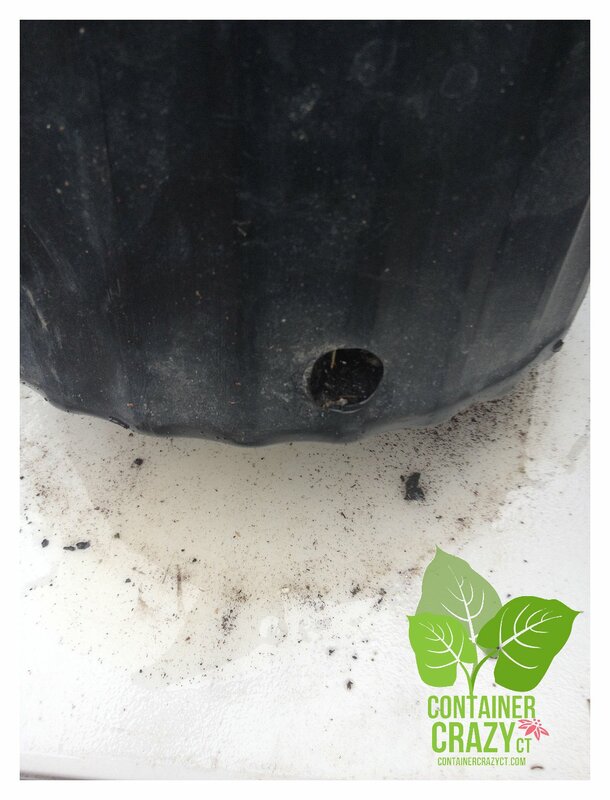 This situation is not too bad in this small ceramic pot, but you can see how excess water collects in the catch tray area. 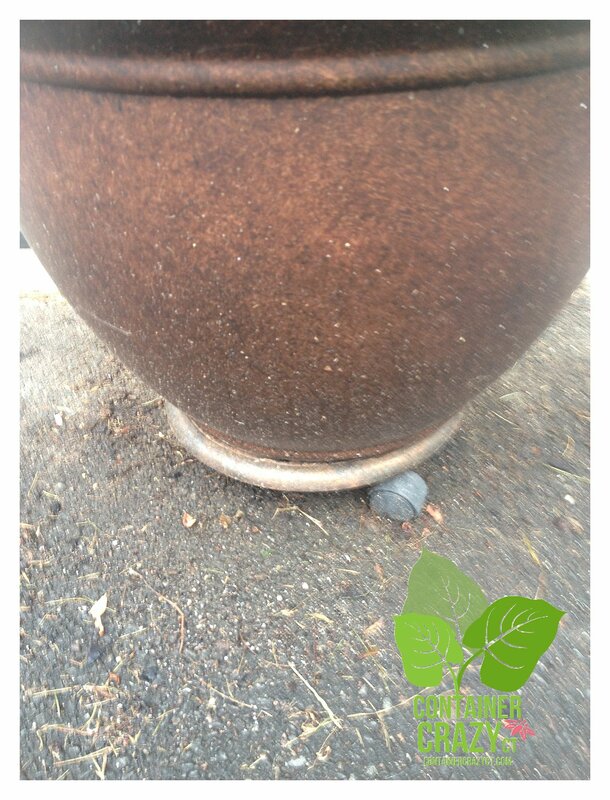 The soil mass is small in this pot and the soil is staying damp right now. In one photo, notice the yellowing of the leaves on the chives – a potential indication of overly wet soils affecting the leaves. So just drain the excess water out. It is not going to evaporate during our rainy week. 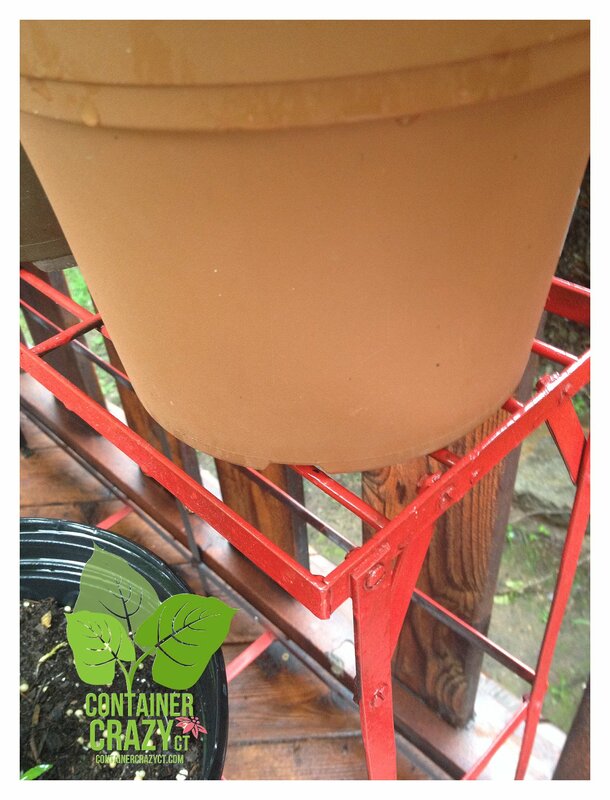 If you have a bigger or medium sized pot with no drain holes, and there is no way for excess water to exit, gently tip your pot on the side and allow water to drain out from the top. 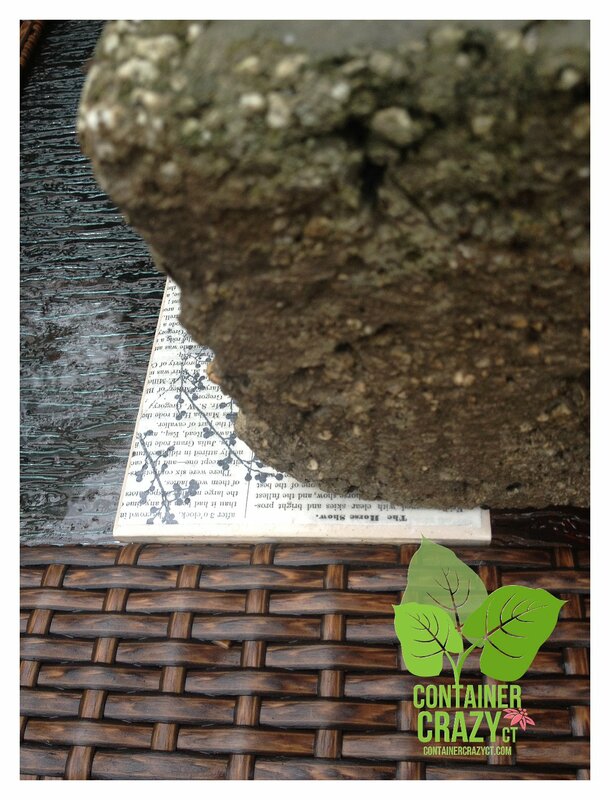 A little tricky to do and totally unnecessary if you followed Cathy T’s Five Must Do’s for Container Gardening – and you know, providing drain holes is a big MUST DO, but if you Didn’t Do, do tip the pot to drain away excess water from waterlogged or very soggy soils if possible. These days, I’ve been keeping very busy with work – so it is hard to believe, I know, but I have some “unplanted plants!” Yikes! So here I have a pot that hasn’t been drilled with drain holes yet, and I had the upper pot sitting in it, but guess what, the water was collecting in the blue pot, so I flipped the blue pot over and set the plant on top for the few days it is raining a lot so the plant in the black pot isn’t sitting in water – unless it is a water plant, the roots in the soil will rot at the base from lack of oxygen. See all that water on the white table on the photo above of the round Hypertufa with the cute little owl? That water is just hanging around, not draining anywhere. 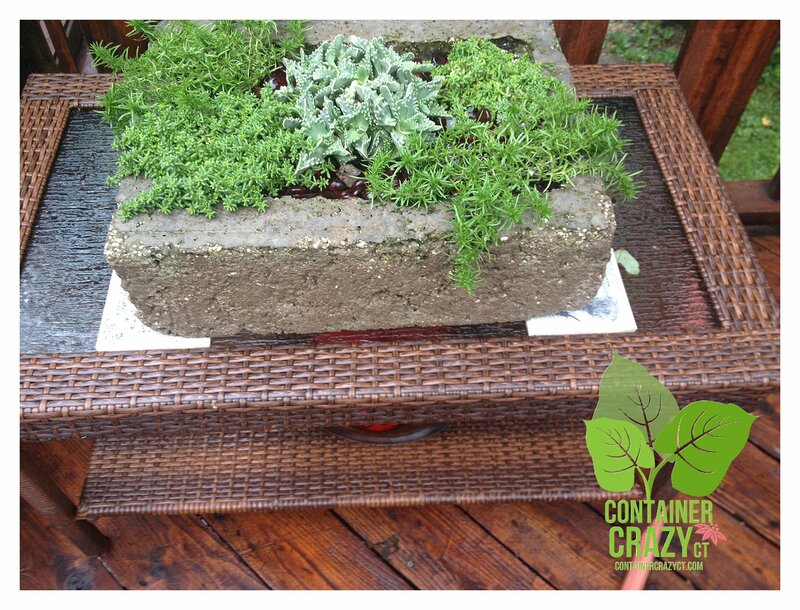 So find a tray, maybe you have a plant tray with holes, or even a oven tray would work, to put under it and allow that water to move away. I set the round dish garden (Hypertufa) on top of the plastic plant tray turned upside down just so it isn’t soaking wet during humid weather. It may seem a little much to go around doing this – but do you want healthy plants all summer? I know I do. So I watch these little things during weird weather. Another option, if you have plants sensitive to damp weather conditions, such as succulents, is temporarily moving the plants under coverage such as a patio umbrella during the rainy week, then moving it back to sun to dry out nicely. Most greenhouse benches have gaps – in order for excess water to drain and move away and out of the pots, and for air movement- so if you have tables with shelves with gaps, grates, or wire patterns – they are prefect for plants, as shown above. And of course, there are the plant dollies or caddys, many with wheels available at plant related stores, or maybe you may find something like a wagon wheel from a tag sale. 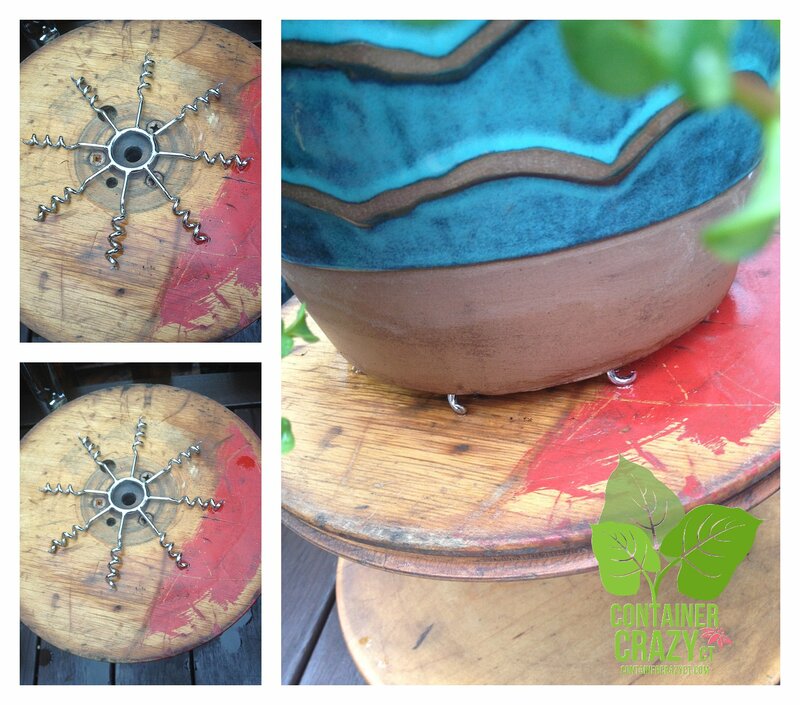 I found a couple wagon wheels at a tag sale last year, and thought I’d use them for some garden related art like item – well they ended up under pots on my driveway. 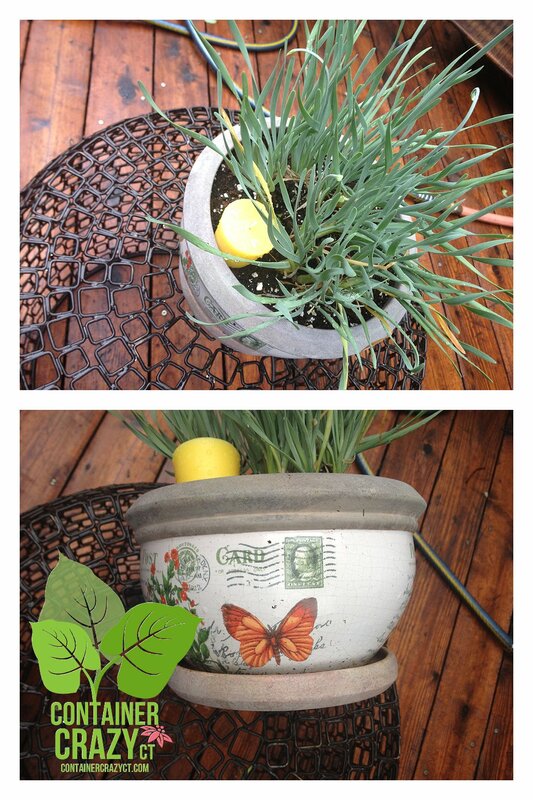 Think out of the box (or wheel) for items to elevate your pots just a bit. There is probably something useful around your home. Mushrooms at the Base (ugh) see how the water is collected on the table? 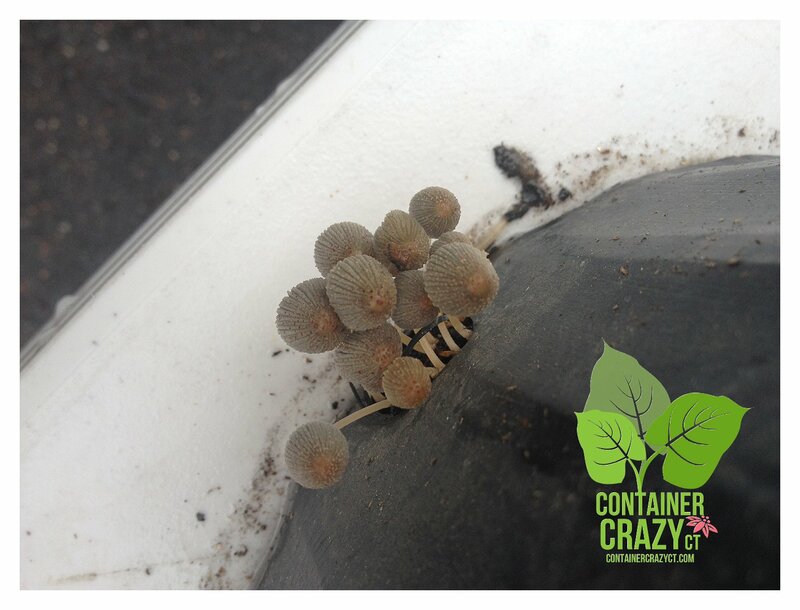 The mushrooms won’t hurt your plants – but I do not like seeing them in my container gardens. An over abundance of water in certain soils (soils without enough porous material such as Perlite) may lead to this problem, or over-watering soils invites mushrooms at times when the weather conditions are favorable for mushroom spores and growth. 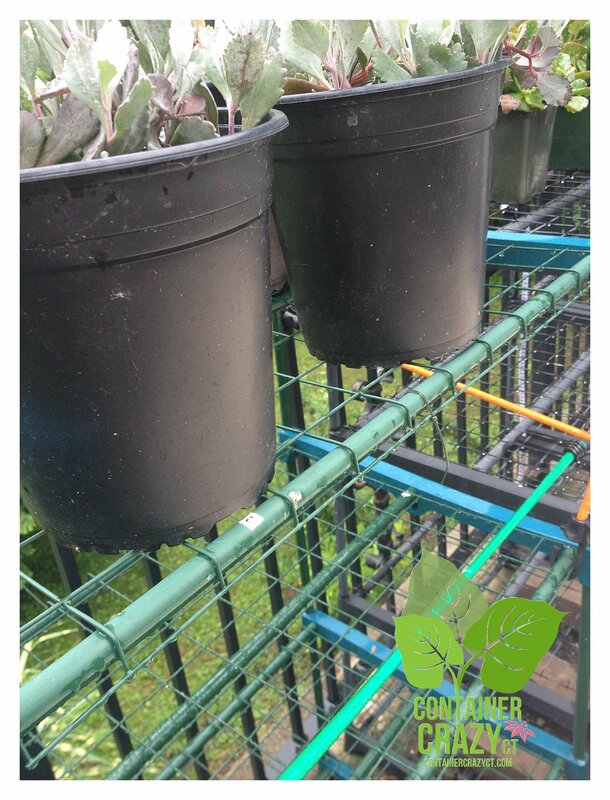 One last comment, although some water is held by the forces of gravity and capillary action in your potting soil in pots, the process of elevating your pots alleviates water sitting at the base of your pot and helps everything in general from staying damp and wet. Water is required for some fungus to thrive, so reduce the potential is my modo. 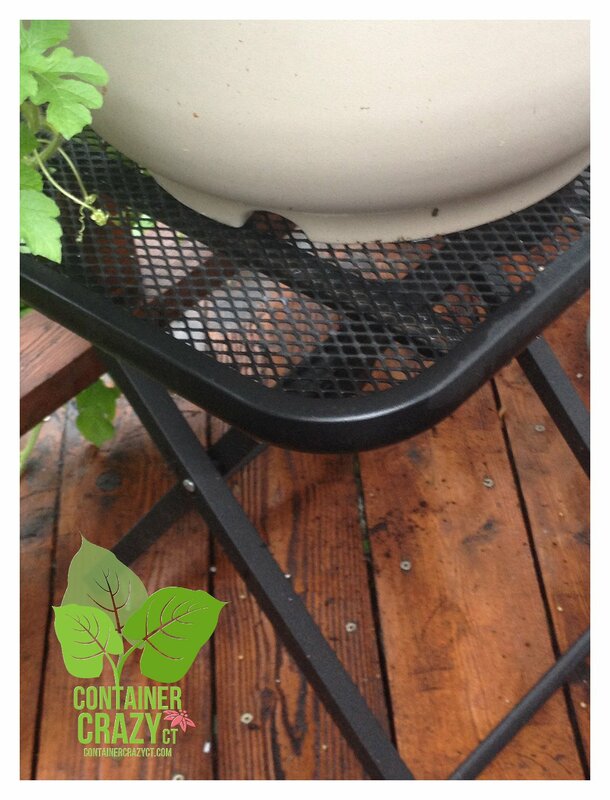 Elevating pots is something I have practiced for years with container gardens, and I believe it truly helps the plants overall health. When the soil is allowed to drain freely and there is air circulation all around the pot and plants, things just stay healthier.